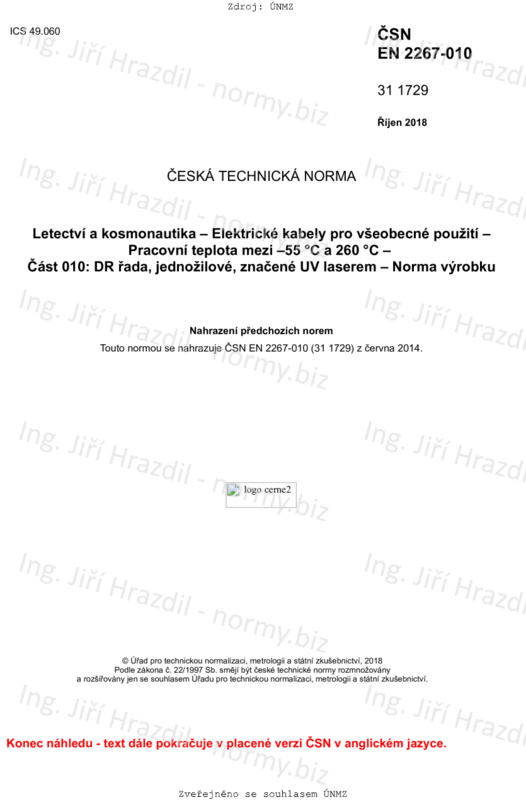 This European Standard specifies the characteristics of UV laser printable electrical lightweight wires DR family for use in the on-board 115 V (phase to neutral) or 200 V (phase to phase) AC electrical systems of aircraft at operating temperatures between -65 °C and 260 °C. These cables are demonstrated to be arc resistant in sizes AWG 26 to 14 (115/200 V AC). In addition, these cables may be suitable for use at 230/400 V AC in pressurised zones only when installed to take account of possible short circuit effects. It shall also be possible to mark these cables by qualified compatible marking. These markings shall satisfy the requirements of EN 3838.